Inovart's unique "Quick Release" system allows artists to quickly and easily change blades by simply pushing up the chuck on the handle. New blades are inserted in the same way, yet the blade remains secure while working. The yellow portion of the handle is removable, revealing a compartment inside that can store up to five blades. 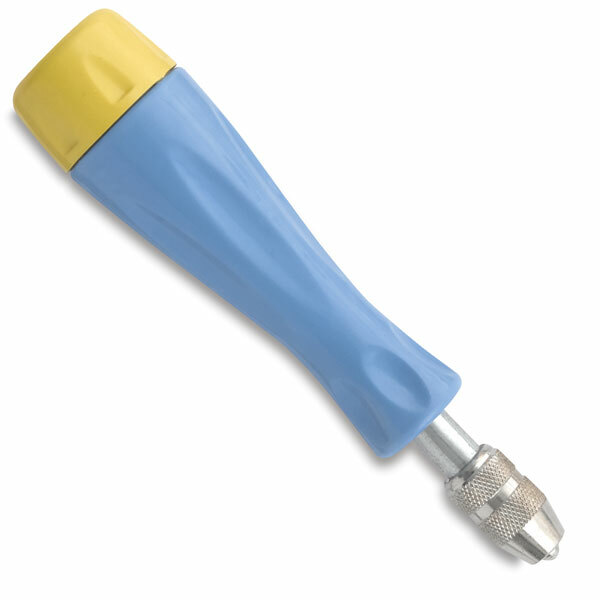 The Quick Release Lino Cutter's ergonomic handle is easy to grip even with wet hands. The blades are made of carbon steel that has been ground to an optimum angle for long-lasting edges. Handle Only — This handle stores up to five blades. Blades are sold separately. Handle with 5 Blades — This set includes a Quick Release handle and five blades, including a No. 1 small U-shaped Gouge, a No. 2 small V-shaped Gouge, a No. 3 large V-shaped Gouge, a No. 5 large U-shaped Gouge, and a #6 Knife. Handle with 2 Blades — This set includes a Quick Release handle and two blades, including a No. 1 small U-shaped Gouge, and a No. 3 large V-shaped Gouge.